Could the U.S. Electricity System Become Like Venezuela’s? In Venezuela, a prolonged drought blamed on the El Nino weather system lowered water levels substantially at the Guri Dam, the hydroelectric plant that supplies the country’s capital, Caracas, with most of its electricity. The dam, built in the 1970s and 1980s, provides over 70 percent of the power generation for Caracas. According to data from Corpoelec, the state-run power company, water levels at the dam, located in southern Bolivar state, fell to 244.9 meters above sea level on March 29. Below 240 meters, vortexes can form and damage the turbines. This condition may be reached by April 30th unless severe rationing is implemented. Because the government was irresponsible in not bringing on line other forms of electricity generation, Victor Poleo, a former vice minister of electricity, blamed poor planning by the government and a lack of maintenance by Corpoelec at the hydroelectric plant for the need to ration electricity. [vi] Experts believe rationing could have been prevented by investment in maintenance and in the construction of thermoelectric plants. These are the same types of thermoelectric plants that President Obama is prematurely retiring due to EPA’s regulations (Mercury and Air Toxics Standard and Clean Power Plan). In drafting its final “Clean Power Plan,” EPA made changes that forced increased intermittent renewable energy, favoring it over natural gas to replace retiring coal-fired capacity. In fact, EPA stretched what renewable power can achieve by using biased historical deployment patterns for renewable energy technologies. For example, the agency assumed that the historical high reached for wind capacity additions in 2012 could be easily replicated despite that high being reached because the Production Tax Credit (PTC) for wind was to expire at the end of 2012, making wind owners quickly complete construction of their wind turbines in 2012 instead of 2013 in pursuit of the government tax payout. 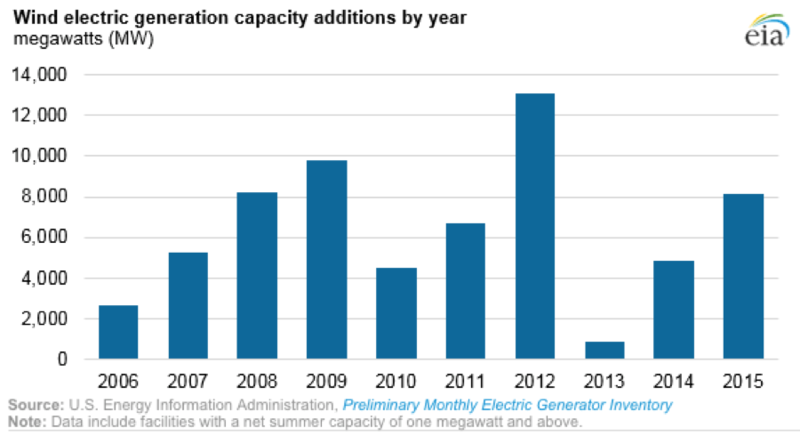 As a result, wind capacity additions in 2013 precipitously dropped as depicted in the chart below. The U.S. has long prospered under an electrical grid system that provides low cost, reliable energy for everyone’s benefit. If allowed by the courts to proceed, the so-called Clean Power Plan will be the costliest and most intrusive EPA regulation ever to affect the U.S. generating sector, and will have no real impact on temperature, reducing it just two hundredths of one degree Celsius in 2100. Instead, it will deny the nation the use of inexpensive coal-fired generation that is half the cost of new natural gas combined cycle technology and a third of the cost of wind technology that it forces us to use. [xi] With its bias towards intermittent renewable technologies, it could destabilize our electric grid, possibly placing us in a similar situation as Venezuela with electric power curtailments and/or disruptions. This fundamental transformation of our electrical system – from low cost and reliable to much higher cost and unreliable – will not be seen as progress by most Americans.